This week’s single of the week was requested by chillo1959 because it was number one when he was born. It was also at the top of the chart on the week my parents got married back in December 1958, and it’s Conway Twitty’s classic It’s Only Make Believe. Conway was born Harold Lloyd Jenkins in 1933 and named him after his mother’s favourite silent movie actor Harold Lloyd. His father was a captain on a ferry on the Mississippi river and his grandfather bought him his first guitar once he showed an interest in music and he used to sit on his father’s boat and entertain the passengers. When he was 10, he formed his first band, the Phillips County Ramblers who were so successful they got their own show on KFFA, a radio station in Arkansas. After he returned from National Service in 1957 he heard Elvis Presley sing Mystery Train and right there he decided on a career in rock ‘n’ roll. That same year he made his first recordings for Sam Phillips’ Sun Records in Memphis, but Phillips didn’t even bother to issue them. Jenkins moved to Mercury and changed his name to Conway Twitty, taking the pseudonym by sticking a pin in two separate pages of an atlas landing first in Conway in Arkansas and then Twitty in Texas. His records still didn’t sell and tiring of playing small Southern clubs, he moved to Canada and found some success in Ontario. In 1958 Conway Twitty and his drummer Jack Nance wrote It’s Only Make Believe in 20 minutes between sets at the Flamingo Lounge, Hamilton, Ontario, but it may have come to them easily because of its similarity to a French chanson, En Ecoutant Mon Coeur Chanter, which is known in the UK as (All Of A Sudden) My Heart Sings. The matter was settled out of court and rather mischievously, Paul Anka revived the song in 1959 and took into the top 10. When Peter Sellers recorded a rock ‘n’ roll parody, he called his singer, Twit Conway. He went to Nashville to record the song and was backed by Elvis’ Jordanaires. Once it was finished Conway was not convinced it was going to be a hit. It was only after a call from a radio DJ in Columbus, Ohio who told Conway he’d been playing it on his show and the song was now a big hit locally. 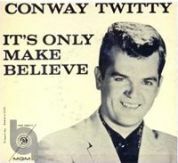 In his heart, Conway still liked country music, but was having rock ‘n’ roll hits so was reluctant to change although he did toy with the idea of recording country songs under his real name and keeping the Conway Twitty moniker for rock ‘n’ roll, but he abandoned the idea. With his distinctive croaking style he had further hits with Mona Lisa and C’Est Si Bon, but his big US success of Danny Boy in 1959 could not be issued in the UK as the words were still in copyright and permission was refused. In 1965 whilst on stage in a club in New Jersey, he decided he’d had enough of rock ‘n’ roll and walked off stage mid-song and never looked back. He turned to country music and scored an unheralded 40 US Country number one hits, specialising in such cheating songs as I See the Want to in Your Eyes, You’ve Never Been This Far Before and There’ A Honky Tonk Angel (Who’ll Take Me Back In). He recorded many duets with Loretta Lynn and one title features in lists of the worst song titles of all-time, You’re The Reason Our Kids Are Ugly. In Nashville, you could visit his nine-acre theme park, Twitty City, which besides him living and working there, housed a gift song, museum and restaurant, but his Twittyburgers came to a greasy end. Conway’s beautiful coiffure became as much a country music joke as Hank Snow’s, neither of them being around when it was styled. He made some fine records including a stunning duet of Rainy Night in Georgia with Sam Moore of Sam & Dave. He was a shrewd businessman as well as a workaholic. He owned a music promotion company, a minor league baseball team called Nashville Sounds and a substantial share in real estate. In late 1992 he began cutting back on his business affairs so he could devote more time to songwriting and more leisure time in the wake of his many years of hard labour. Sadly, the following year whilst travelling home from a concert in Branson, Missouri in his tour bus, he suffered an abdominal pain which turned out to be an aneurism and he died the next day aged just 59. He received many honours in his lifetime, but his favourite and the one he was most proud of was the honorary title of Chief of the Choctaw Nation. The Choctaws gave him the Indian name Hatako-Chtrokchito-A-Yakni-Toloa which translates as Great Man of Country music.